"Wynton Marsalis" (1999) by Murry DePillars, former dean of VCU School of the Arts. A bare-breasted Aunt Jemima bursts forth from a box of pancake and waffle mix, her black-gloved hand menacingly holding a spatula overhead. Yes, she’s wearing the stereotypical apron and head scarf, but she’s also posed in front of an American flag with each star symbolizing a Chicago cop’s badge, a reference to the police raid on the Black Panthers’ headquarters there. Side views of additional boxes of pancake mix reveal ingredients: South Africa, Watts, Angola, Harlem, Roxbury, Milwaukee, while another box’s ingredient list includes Civil Rights icons such as Martin Luther King and Rosa Parks. The imagery and iconography of artist Murry DePillars leaps off the walls of the Black History Museum in their first original exhibition, “Murry DePillars: Double Vision” opening Feb. 3. The retrospective exhibition features 37 examples of DePillars’ distinctive work, spanning the period from 1964 through 2007 and dealing with themes ranging from ancestral Africa and American enslavement to the Civil Rights movement. Arriving in Richmond from Chicago in 1971, it was barely five years before he became the dean of the VCU School of the Arts and began developing the school into one of the largest art schools in the country. But no amount of administrative responsibility could diminish his passion for creating art. The exhibit begins with DePillars’ briefcase which became his traveling studio when work responsibilities kept him away from Richmond. An entire gallery of the exhibition is devoted to the small scale portable works he created while on the road. Carefully composed with a brilliantly colorful and distinctly geometric element, the paintings have a quilt-like aesthetic he carries forward throughout his career. The centerpiece of each piece may be easily distinguishable, but a closer look reveals layers of ghost images embedded behind and around it and often referencing the past. DePillars was an inveterate researcher of art history, distilling the historical traditions of African art going back as far as Saharan cave paintings and incorporating elements into his work. Music is also a thread, with his love for jazz having begun when he was a youth in Chicago. 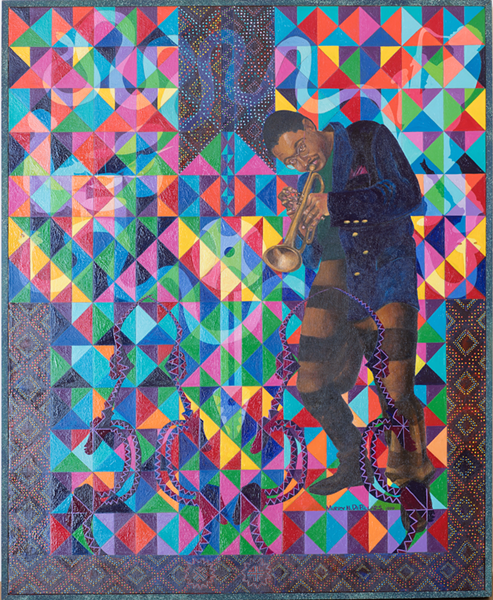 The large scale work titled “Wynton Marsalis” from 1999 is a collage-like painting combining a photorealistic depiction of Marsalis lost in blowing his horn over a colorful geometry featuring embedded images of a sax player and drummer combined with dot and textile patterns relating to the African practice of scarification, as well as the power of Marsalis’ music. “We got to know the whole Marsalis family,” recalls the artist’s widow, Mary DePillars, who lent the art for the show. She explains that as dean in 1986, her husband hired jazz pianist Ellis Marsalis for two years as a visiting professor and coordinator of the Jazz Studies program, a legacy that can be measured in the sheer amount of talent the program has attracted since. Near the Marsalis piece hangs “Kind of Blue,” DePillars’ tribute to Miles Davis whose music he’d long admired. VMFA curator of African Art and Black History Museum board member Richard Woodward reminds viewers that they should take delight in the show, remembering all that DePillars did for Richmond and Virginia. A wall sign in the exhibit suggests, “take your time, look twice,” excellent advice for those hoping to absorb even a fraction of what DePillars was trying to convey in this multi-layered and fascinating show. “I would say look thrice to see everything,” advises Woodward.